Hal-Con, we’ve come a long way. In a lot of ways, Hal-Con is my home con, because Nova Scotia is my home, even if I don’t live here anymore. 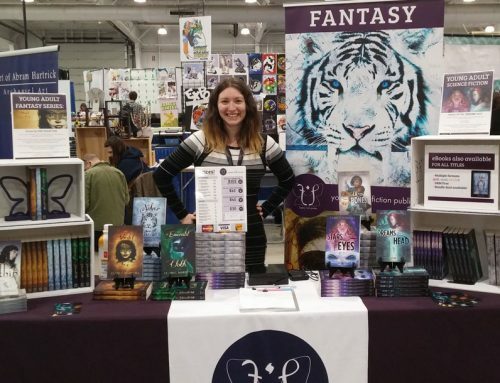 This was my fourth year at Hal-Con and every year my regulars come out and support me and my books. Thank you to everyone who returned and bought books this year. Also big thank you to my sister Jessie who helped out all weekend—including set up and take down and being my wing-lady! YAY SISTERS! As with last year, Hal-Con attendance was capped because of capacity in the convention centre. C’mon Nova Centre, hurry up and get built. The biggest downside this year was the placement of the artist guests. Every year that I’ve been going (and probably for years before that), Hal-Con has changed up how they place their artist guests. The first year I was there, most of us were on the ground level and benefited from the free entrance (except when the fire marshal shut everything down). Second year, I was upstairs in a segregated room with the artist guests, and sales suffered. Third year, everyone was together in the big rink-area and sales were very good. This year: artists and vendors were more integrated in that same area…and artist guests were moved to their own private area. Don’t even ask me what floor it was. Some people call it the second floor. Others say the fourth. That’s how crazy the convention centre is. I knew immediately once the vendor placements were announced that I would be losing hundreds of dollars in sales by not being with the other vendors. Yes, I was an artist guest, and there were privileges that came with that. But ultimately I cared more about a) people being able to find me and b) people buying my books. We have to make the most of the location we are given, however—just like any other con. And I’ve been wrong before about my location being terrible—sometimes a location can surprise you. The way the artist guest “alley” was set up: a semi-circle of tables, backed with drape, leading down to the “main event” – the voice actors from Sailor Moon: Linda Ballantyne and Toby Proctor. Very cool that they were there—they’re super nice and very engaging with their fans. But it’s not like they were there all the time–the line in the picture above would form in some degree every time they made an appearance. Behind the drape there was a hidden walkway that led down to the green room that held snacks and coffee for guests. Beyond that were special signing booths for the celebrities and bigger authors, and the Supernatural Impala. Usual problems with being near or across from the guests: depending on the kind of guest they are, they don’t always have large displays, and/or they’re not always at their table. If a customer sees a near-empty aisle that isn’t populated with product—guess what, they’re not going to go down that aisle! So I dressed up my table, pointed my covers toward the trafficked areas, and tried my best to tractor beam in some interest. Most of the time, the area was not highly trafficked. The only times it got crazy was when Linda and Toby were signing. Then there was a line. And there’s nothing better than talking to and selling to people with nothing else to do! I think I maximized the use of my location, though a lot of my customers expressed confusion and frustration because I wasn’t easy to find. So, for this display I ended up stealing some of my sister’s furniture to create the look I wanted. I created two focus areas for my two series. The Violet Fox area is actually a gaming table, but we draped fabric over it to create two distinct upper and lower “shelves.” The tables themselves seemed kind of narrow and shorter than 8ft, but at least I didn’t have to crawl under the table to get in and out. We bought some fresh flowers, and although not pictured, we added some purple ones for the Saturday and Sunday. And thanks to Sam, I now have a new whiteboard! Bye bye, dollar store whiteboard, hello sturdier, larger board. Jessie drew the pretty faery and styled the text. This space was roughly the size of an artist alley table space, but with the added bonus of backing drape (not every artist alley space has that). The more books I get, the more tight this space becomes and the more I have to get creative. My name was above it so that was fun! As mentioned, due to my location, I lowered my sales expectations for Hal-Con this year. Surprisingly enough, though, counting my per diem I did make quite a bit of money at this con. And since I only had to pay for my flight, my expenses were otherwise low—so Hal-Con turned out to be extremely profitable for me this year. Usually it is a break-even or slight profit con (though again, I use this con as an excuse to come home!). I think my guest status, combined with my returning regulars & friends carried me through. Unfortunately I didn’t have Hunger In Her Bones ready, but I took pre-orders and that was successful. It made me realize that I need to be always taking pre-orders for my next books of the year. Orders for The Emerald Cloth and my new potential horror book will need to start in April at Calgary Expo—which means I need to have cover art by then. Who orders the next book without knowing what it looks like? Pretty much no one. Unless you are extremely established. Sales were overall steady throughout, even though it did feel slow at times. Sunday seemed to be fairly robust, and even if I wasn’t actually taking someone’s money, someone was always approaching me to talk or ask a question about my books or publishing in general. I kind of met Phil LaMarr by accident. Between packing and travelling and conventioning in Winnipeg, I didn’t pay much attention to who the attending guests in Halifax were. Also as discussed previously, I am also bad at faces so recognizing celebrities is not my strong suit. So when he peeked his head around the drapes, wondering what exactly was beyond the main guest signing areas, I said hello enthusiastically, noting his guest badge. My sister was there too, and the three of us chatted for a while until I had a customer. Afterwards we looked him up and I was like OH Hermes from Futurama (and many other cartoons & games that I didn’t even realize)! He is such a sweet man, so down to earth and funny. We got to chat a few times throughout the weekend. Hopefully we get a chance to meet again! Gates MacFadden also stopped by the booth. Again, I had a moment where I was like, wait, is that Gates? No, I don’t think so, but maybe it is? It totally was. She pointed out the promo sign for Hunger In Her Bones, and then wow’d at my entire display. She said congratulations to me for authoring and publishing my books, saying that it’s much easier to do what I do today what with the technologies available. She was just generally impressed with my stuff, so very cool! Met Maggie Stiefvater for a second time. She was hanging with other author buds. Got my copy of The Scorpio Races signed—the only book I had on hand of hers—so that was fun! One of my favourite people moments of the con was the World Building panel. Everyone on that panel was so talented and had something to contribute. I so enjoyed talking with Kevin Hearne, Ben Templesmith, Mike Rooth, and Chris Tulach. Also met the talented Youtuber & comic artist ALB and new publisher Joel Duggan, both super nice and enthusiastic. There is something about bringing a group of creators together to talk about how they create, and encouraging others in their creation process, that makes me feel centered—like I have found others that finally speak my language. The only thing I wish was different about the panels in general was the moderation. One panel, the “moderator” just stood up and introduced us, and then sat in the audience. Another panel was actually moderated and the guy had prepared questions. The third panel, we self-moderated. I mean, I’m used to self-moderating, and I have moderated as well. I just wish it was more consistent across the board. Anyway. In terms of customer interactions, I had a number that stand out prominently, but none so touching as this: an older gentleman approached my table, pleased that he had finally found me. He told me that he had searched the entire vendor floor, and asked every book vendor if they carried any Clare Marshall books—and then when they said no, he told them they should! Haha. He proceeded to say that he bought Stars In Her Eyes and Dreams In Her Head the previous year, even though he wasn’t much of a reader. He read them and told me that for the first time in twenty years, he became interested in reading again, and now reads all the time. Isn’t that amazing? It’s moments like these that remind me that even though I create things that speak to me, they can also speak to others too. And funniest interaction? A family bought The Violet Fox for the second time because, get this: a dog ate their copy. Yes. You read that right. A DOG ATE ONE OF MY BOOKS. Because it was so tasty. A ringing endorsement?? Many thanks again to all that stopped by the booth for a chat. This year’s Hal-Con was completely different because I was a guest! I received a per diem to be a guest at the convention, and a table in the artist guest area. I told them I was happy to be on as many panels as they needed. At Hal-Con, panels are reserved for guests or knowledgeable experts known to the staff. I don’t mind doing a lot of panels as it helps position me as an expert, and it’s fun to share my knowledge about publishing! 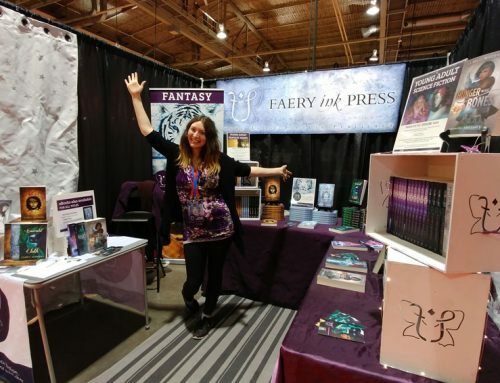 I was branded as a local author guest, even though I’m no longer a local—I live in Calgary, but I grew up in rural Nova Scotia. I plan my trips to Nova Scotia—my home—around this convention. Once they realized that, they offered to pay for my hotel room. While not totally necessary, this ended up being extremely convenient, as it meant I could use the many inside walkways from the hotel to get to the Convention Centre. Extremely grateful for this. The weather was cold, and crossing the ferry in the morning and walking up the hilly streets of Halifax in heels would not have been fun! Or back down at night, after the soiree, again in heels. I also received a little gift bag filled with candy from the Freak Lunchbox and some other fun Hal-Con swag. I also had a personal assistant! Courtney was very professional and always thought of any potential need I had. And of course because it’s Nova Scotia, Courtney knows one of my friends I went to school with—Lizzy! Personally, I’m not that great at delegating tasks, so the idea of having another human being fetch me coffee, or help me find my panel room, or help me brainstorm any idea felt very strange to me. But once you’re in the swing of the con, an assistant is invaluable. Especially when she tolerates and even encourages the loud singing of show tunes in Scotia Square after the soirée. YAY. The soirée is a ticketed event mostly for guests, warp speed pass holders (a special weekend pass), Hal-Con staff, and any attendee lucky enough to score a ticket. Basically, an opportunity to socialize and have more of a one-on-one with the guests, even the celebrity guests. It was held in an event room, we got two drink tickets (basically enough to make you spend more once you ran out….hahaha…), and they even had event photographers taking awesome pictures. Look at this crazy one they took of me & my hair! In general, all the staff at Hal-Con were extremely professional, well trained, and knew what they were doing. C4 Con, take a lesson from Hal-Con. At C4, Chadwick and I watched a clump of volunteers move around the con listlessly, as if they had nothing better to do. The volunteer staff I worked with had earpieces and radios, and were never idle. To my knowledge, they treated the guests with respect. Huge thanks to Adam Sigrist for his time, effort, and organizational skills on the guest side. 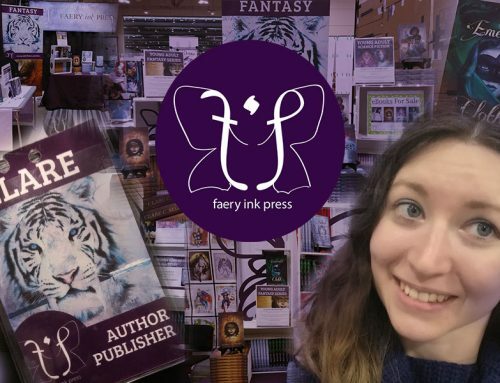 I was on a panel on Sunday afternoon called the “Ins and Outs of Self-Publishing” and I want to re-iterate some of the points I made there, and clarify/change some of the advice. I work in publishing—it’s where all of my income originates. Whether it’s editing, formatting, website work, or Faery Ink Press book sales, I wear a lot of hats. And I’ve worked really hard for the past six years to get where I am today. The other three people on the panel, they don’t work in publishing and they have day jobs. They all self-publish, like me. They’re out there promoting it locally, and that’s commendable. They made some important points about making the time to write—that’s certainly something I have to work on. Though there were times when their advice reflected their inexperience—you don’t sue printers off the bat for making a mistake, you call them and ask them to fix it. Not paying for a professional editor? Hmm, welp, that’s not really a good idea–you always get what you pay for. I came across pretty heavily on the panel because I take this whole business seriously—or more accurately, I treat it like a business, and I expect everyone to do the same, because it IS a business. You’re trading your hard work for someone else’s hard-earned dollar—your customer deserves not just the best product that you can make, but the best product, period. I was the “doom and gloom” as one of the other panelists put it, which got some laughs—but you know what’s not a laughing matter? Spending all of your disposable income on a book business and then ending up with piles of product in your garage that you can’t sell. Or more accurately, that you don’t know how to sell, because you didn’t think it through. That’s not funny. That’s bad business. And I wouldn’t wish that on anyone. Yes, anyone can make a book these days. But if you’re just anyone, the odds that you’ll successfully distribute and sell your book(s) over a long period of time is not great. You have to pound the pavement, especially if you’re selling physical books. And yeah, lots and lots of people still read physical books. You want to make a couple of books and sell them locally, that’s fine. Just know that the amount of work you put into promoting will pay off—if you put time and energy into your brand, people take notice and treat you accordingly. I know because that’s how I’ve gotten this far. People don’t stop at my table just because I have books. They stop because everything on the table is presented in a way that appeals to my audience. Another misconception that was thrown around is that eBook sales are great, so just “do” that, and you’ll be rolling in it. Listen. 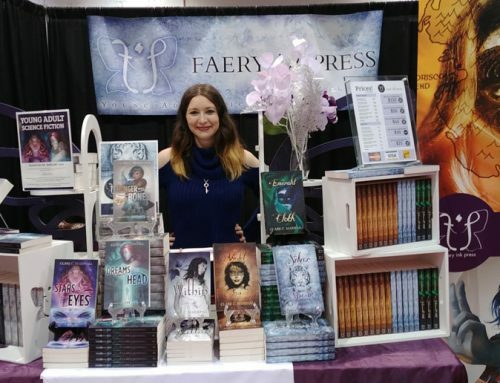 EBook sales can be good—and it’s “cheaper” to make eBooks—but some markets like romance and scifi lend themselves to eBooks because the readers whip through them. The truth is that eBooks are less than 20% of the total book market. Don’t use the eBook excuse to cheap out on print formatting if you plan to sell physical books. Don’t think that just because you’re only doing eBooks that it means you can cheap out on editing or cover design. Just because there’s a cheaper option, doesn’t mean you should use it. There comes a point where you have to invest in your product. Sometimes that investment happens before the product goes to market, and other times it happens later on down the road. Just know that your readers know when you’re cheaping out, and no one likes feeling ripped off. The truth is, it’s not just about eBook sales, and it’s not just about being “good” at social media. Optimizing one or both of those things will bring you a little bit closer to your sales goals. But nothing beats pounding the pavement, showing up to industry-related events, talking face to face with people at local markets, and knowing your stuff. Especially that last part. Hal-Con 2017 unfortunately will not be held in the new Nova Centre, and it will be held the same weekend as Edmonton Expo, September 22-24. Much earlier than its usual dates. Since Edmonton will be geographically closer to me, and I theoretically won’t be spending Christmas at home in 2017, it makes the most sense for me to spend time in Edmonton instead of travelling to Halifax to this one event. 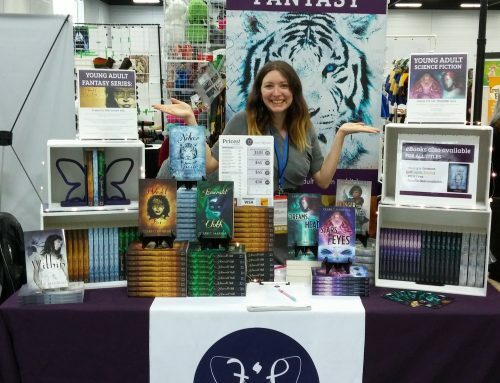 However, I would very much like to have some kind of vendor presence at Hal-Con, so my regulars can buy my next books! Keep an eye on the events page to see if I can make that happen. “… you know what’s not a laughing matter? Spending all of your disposable income on a book business and then ending up with piles of product in your garage that you can’t sell.” I’ve never self-published, other than that special edition thing I did with Greg and Chadwick, but I know so many people this exact thing happened to. One friend ended up with a boatload of HARDCOVERS where the pages were DOUBLE-SPACED! He ultimately learned a lot and created a publishing company (he was also at the Winnipeg con, elsewhere) but most people just end their careers at the horror story. And it’s not just self-publishers — I have three hundred copies in my basement of a book that I did with Coach House Books that I don’t know how to sell (I ended up buying their print overrun), although it’s less concerning because the book is still in print and in stores etc. through them. Anyway, I always appreciate doom & gloom! So many of the younger authors I meet with, especially the ones interested in self-publishing, have zero sense of the real world matters like what to do with these books once they exist. When people ask me what the most important thing I wish I knew before was, I tell them about tax laws.